Staff Members and Councillors from Dodington Parish Council along with representatives from Abbotswood School are pictured below with their newly installed defibrillator. This is situated outside the changing rooms at QEII (previously Kelston) Playing Fields – on the footpath opposite Abbotswood School. It is accessible to the public (although to avoid vandalism is in a locked cabinet). In the instance that you need to dial 999 and you are in the vicinity of this defibrillator you will be told the code to access it. 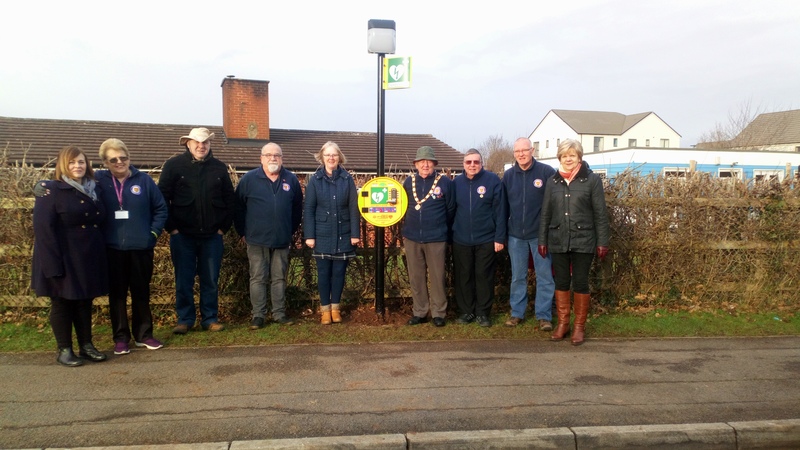 Dodington Parish Council installed their first Public Access Defibrillator in June 2015 at their hall on site of Raysfield School, Finch Road. This was after being approached by a local parishioner who’s son had had a SCA (Sudden Cardiac Arrest). Despite being a young fit boy of just 17 years age he collapsed without warning – and this is what happens – you can suffer an SCA with no warning and it doesn’t discriminate. Thankfully the parishioners son made a full recovery and since they have been wanting to raise awareness and try and get defibrillators installed (as they can make all the difference). Dodington Parish Council are really pleased to have a second defibrillator – and in the next financial year are looking at installing a third – in the rural ward area – near Codrington. If you have any questions – please don’t hesitate to contact the Clerk / Deputy Clerk.